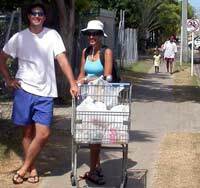 July 6, 2004 - For those of you not in the loop, three weeks ago I embarked on a world tour. I am currently in Alice Springs, Australia on my way across the outback. I am traveling by Land Rover with my parents (I know that it may not sound cool to live in a car with your parents when you're 25 years old, but hey, you don't know my parents...plus, the rent is cheap....) on a massive loop across the continent. The trip started in Maroochydore (just north of Brisbane) and we are on our way to Ayer's Rock (just 400 km west of where I currently sit). So far we have traveled 3400 kilometers and eaten twelve packs of ginger snap cookies. We've done heaps of interesting things along the way. There was an excellent bench in a town called Barcaldine made of wooden planks that you could play like a giant marimba (wooden xylophone thingy, for you non-percussive types). When you banged on it, the notes rang out through the entire town. I played "The Lion Sleeps Tonight" on it for about an hour and even gathered a crowd of people, most of whom wishing I would stop. There was a musical fence in Winton that had a whole bunch of junkyard bits to bang on. It was within earshot of a caravan park (camping area), so me, mom, and dad tortured them for an hour with mostly-rhythmic thumping and crashing. Our mission: Annoying Australia, One Camper At a Time. I should mention that we have been filming everything along the way with a rather good video camera to make a documentary of the trip. This is our warm up film for the big one we will make of sailing back to America. I am the cameraman, soundtrack composer, and heavy-lifter-guy. Dad is the on-camera talent and pay-for-stuff-guy. Mom is the producer who decides what we visit and makes sure dad and I don't spend two hours filming a coconut when there is a fire-breathing ceremony of dancing natives going on just behind us. Speaking of soundtracks, we have already written one new song for our Oz video. It is called "Every time you see a road train, there's one less kangaroo." It is my first country song, although it is more a hyperactive jig, really. (For those of you who don't know, road trains are humongous trucks that transport everything from cattle to toilet paper. They are semi trucks on steroids, often pulling four trailers in a row behind them). Driving at night is not safe, as kangaroos have a rather single minded and short sighted habit of hopping across the road when they are scared by passing vehicles. Because of this, almost all vehicles have giant bull bars on their bumpers, called "roo bars". Still, kangaroos come out at dusk, so it is best to simply stop in the evening. The only vehicles immune to this law of common sense are road trains, whose sheer mass allow them to drive whenever they want (hence the title of the song). We aren't sure where we are going next after Ayer's Rock (Uluru), but the options are all good. The section of Oz we are in is called the Red Center. From here we head south, then back to the coast. My fiancée, Sarah, will be arriving in late July to start the boat trip up the Great Barrier Reef. August 5, 2004 - Well, Sarah's Journal page is putting me to shame, isn't it? Still, I am a firm believer in quality over quantity, so I shall lick my wounds and strive forward. We're still in Mooloolaba, but tomorrow we brave the mighty southern ocean swell and begin the trek north. Depending on the wind direction and overall seasickness of the crew, we aim for the Whitsunday Islands, which mark the southern end of the Great Barrier Reef. Rumors abound of warm water, warm weather, and warm breezes on islands where Diet Coke flows like honey and coconuts melt in your mouth. But we have weird friends, and they tend to exaggerate. I am excited about cruising again, and very excited that Sarah is here to experience it with me. She is sort of SCUBA certified (to about 15 feet of depth, so it's more of a snorkel certification, really), so we might do some diving soon (well, I will. She may just float on the surface). I am also pumped about windsurfing again, so stay tuned. In music news, five new songs are in the works and since we will be sailing for four days straight, you never know what could happen. I hope to finish a few up over the next week. August 17, 2004 - I am currently in Airlie Beach, on the southern end of the Great Barrier Reef. This is one of the most beautiful cruising grounds we've seen, although it can be a bit crowded with charter boats (rental boats) at times. Tomorrow we head north to Townsville in time for the Bull riding World Championships on Saturday. 1. Most "Memorable" Experience - Climbing the steep bits of Ayers Rock with one hand on the guide chain while filming dad with the video camera in the other. 5. 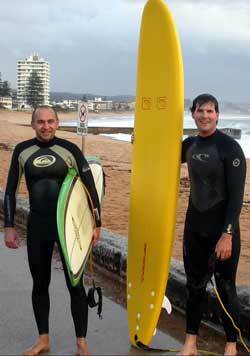 Most "Remember For the Rest of My Life" Experience - Surfing with a friend from college, Slava, who lives and works in Sydney. Saw him for the first time in two years. Very cool. We used to look at surfing sites on the computer in Kentucky. The water was rather cold, but that is what wetsuits are for. The surf was pretty big. And it was overcast and raining. In the middle of winter. My parents thought we were insane. They sat in the car watching us get obliterated by waves and wondered where they went wrong when they raised me. 7. Most "Shocked" Experience - When I saw the opal mining holes in Coober Pedy, I was floored. There are warning signs everywhere depicting stick men falling backwards into holes, and at first I thought they were funny. Then we parked the car and walked over to one. The holes are circle shaped, six feet in diameter and 100 feet deep. And everywhere. There are holes everywhere. They are rarely marked...just innocent little Holes of Imminent Death littering the landscape. By the way, they filmed Mad Max 3 and Pitch Black near Coober Pedy, because the landscape looks like an alien planet. 8. 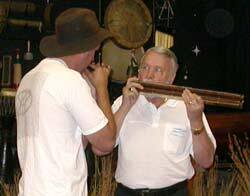 Most "Interesting Musical Collaboration" Experience - While in a didgeridoo shop in Alice Springs I met a German guy named Helmut who was carrying the longest harmonica I have ever seen. It was a chromatic instrument with over 140 holes. The beast was two and a half feet long and worth 2000 bucks. He showed me a CD from his days in a Harmonica Quartet (You could get away with lots of weird stuff in the 60s). I ran back to the car and pulled out the ten hole harmonica I carry for emergencies like this. Thus began a clash of musical cultures and generational miscommunication. He played an oom-pa-pa polka rhythm in a random key and I wailed some blues riffs. Between the two of us, we managed to create an entirely new style of music - one without direction or apparent key. After a few more tries and polka rock skirmishes we sorted things out to actually play some interesting tunes. In the end an excellent time was had by all. We’re in Darwin, on the northern coast of Oz. It is our last stop on the great southern continent. Ironically enough, “survival of the fittest” seems to be Darwin’s unofficial motto. Why, you ask? 1. It is hot here. It is winter. Summer is monsoon season. 2. 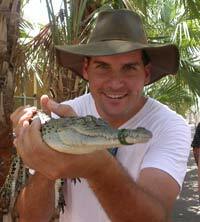 There are saltwater crocodiles in the water so you better not swim unless you can swim really fast. 3. Every year the ocean is besieged by lethal box jellyfish for months at a time. 4. Pizza is prohibitively expensive and often contains barbecue sauce instead of ketchup (what is wrong with these people? That is sick. Sick, sick, sick.). Besides that, Darwin is a cool town. A bit pricey, but at least they have snow cones. Speaking of which, tonight is the night market at Mindle Beach. We went to the one on Thursday night, which ruled. 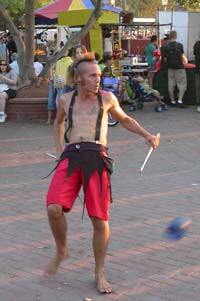 Street performers, a guy wearing elf ears and twirling sticks, a rather repetitive rap band, a hyper didgeridoo player, a guy cracking whips, craftwork stalls, and a huge variety of food….what else could anyone ask for? But back to the food. Mom, Dad, and Sarah foolishly agreed to split up and meet back in front of the band with food we chose from different vendors. Thus began a night of Snow Cone Bliss. The three of them had fruit bowls, honey dough things, ice cream, and thai food. I had Snow Cone Bliss. Oooooooh yeeeeah. Then I went back for another enormous helping of Snow Cone Bliss. It was life changingly good. Tonight we go back for more. 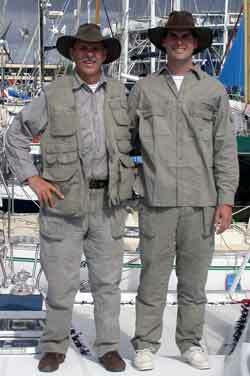 We continue to zip up the Great Barrier Reef at breakneck speed. Currently we are berthed at Marlin Marina in Cairns, the scuba diving capital of Oz. Every morning dive boats, fishing boats, and people ferries trek out to the Reef, overflowing with excited tourists. Every evening the boats return with a sunburned cargo of super-happy or super-seasick passengers. Cairns is a happening place. Not only are there more tourists than you can shake a stick at, if you shake it long enough and call it an Authentic Souvenir Stick, they’ll buy it from you. That was it. Just to show I didn’t forget about you guys over the past month. From Cairns we went to Lizard Island, Thursday Island (in the Torres Strait), and then on to Darwin. Lizard Island is a cool footnote in nautical history. When Captain Cook first explored the east coast of Australia, he didn’t know about the Great Barrier Reef. All he knew was that every time he tried to sail away from the continent, huge reefs forced him to turn back. The further north he sailed, the tighter the squeeze from the reef. One of the bummers about exploring is that if you need help, no one (including yourself) knows where you are. To get a better view of the reef, Cook climbed to the top of Lizard Island, where he saw a passage out. Today that channel is called “Cook’s Passage”. While we were at Lizard, we climbed the hill too. At the top it’s easy to imagine Cook intensely studying the reef while kicking small rocks onto sailors below who annoyed him. When we swam back to the boat, I saw a small sand shark chilling out on the ocean floor. They are harmless, so I pointed it out to Blissfully-Swimming-Sarah who quickly became an Angry-At-David-For-Pulling-Her-To-The-Shark-Sarah. We survived. The shark survived. All were happy except Sarah, and thus, me. 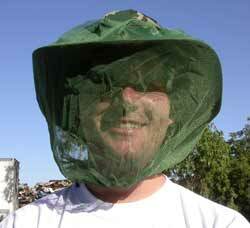 Thursday Island was notable mostly for its Commando Mosquitoes. Those little punks defied the laws of physics by attacking us every night, in spite of a steady 15 knots of wind. Tomorrow we leave for Bali. The passage will take about 5 or 6 days, although current weather reports indicate almost no wind, which means we may be motoring a lot. Sarah is happy at the thought of flat seas. Dad wants wind so we don’t need to use fuel. Mom is good to go either way as long as she doesn’t get seasick. I am pumped about going somewhere new and writing some tunes along the way. Yes, there is a rope around his jaws. A wuss I may be, but I'm a wuss with 10 fingers. Helmut and his chromatic harmonica. Sarah up at the airport.